Music Under the Stars ends July 30! Don't miss the final concert of summer! Bring a chair, blanket and even a picnic dinner, just don’t forget your appetite for great music! Guests can purchase sweet treats from our ice cream vendor, take a tour of the historic Barclay Farmstead, play in the moon bounce, stop by the B101 tent or visit our sponsors! Concerts are cancelled in the event of rain. Don't miss this "Birth of Rock" concert featuring the music of Elvis, Jerry Lee Lewis, Chuck Berry, Little Richard and Buddy Holly. 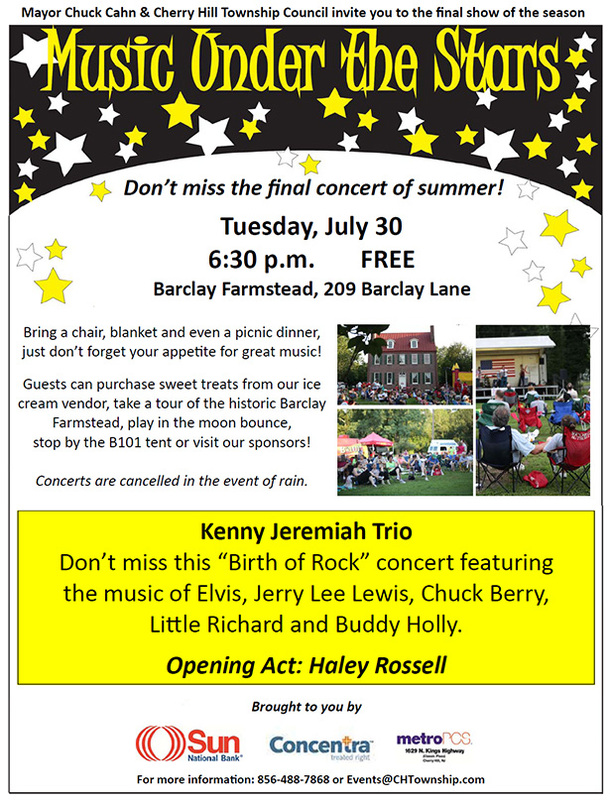 Music Under the Stars Tues., July 16 @ 6:30 pm. Enjoy Hank's Cadillac with opening act, The Hess Brothers. Free. Call 856-488-7868 for info.